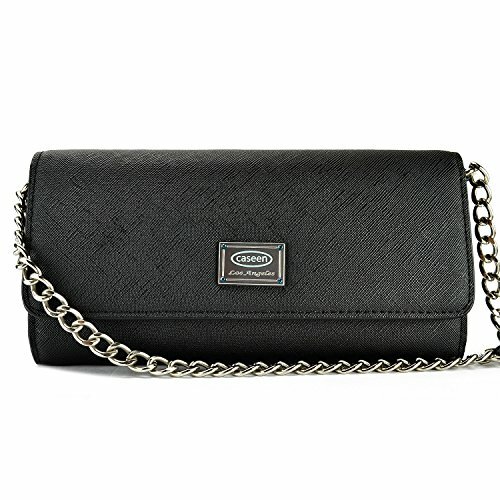 A minimalistic fashion smart phone purse with a stylish brass silver colored chain shoulder strap. It contains 3 sections inside along with 6 credit ID card pockets for ample storage of your smart phone and other necessities. On the rear is a convenient zipper section perfect for money or coins. • Fits most smartphones including the iPhone 7 / 7 Plus / 6 / 6S Plus, Galaxy Note 5 / 4 / S6 / S5, and more! Device, Credit Cards & Cash NOT included! Fits most smartphones including the iPhone 7 / 7 Plus / 6 / 6S Plus, Galaxy Note 5 / 4 / S6 / S5, and more! If you have any questions about this product by caseen, contact us by completing and submitting the form below. If you are looking for a specif part number, please include it with your message.